How to disable your ad blocker on Slate. 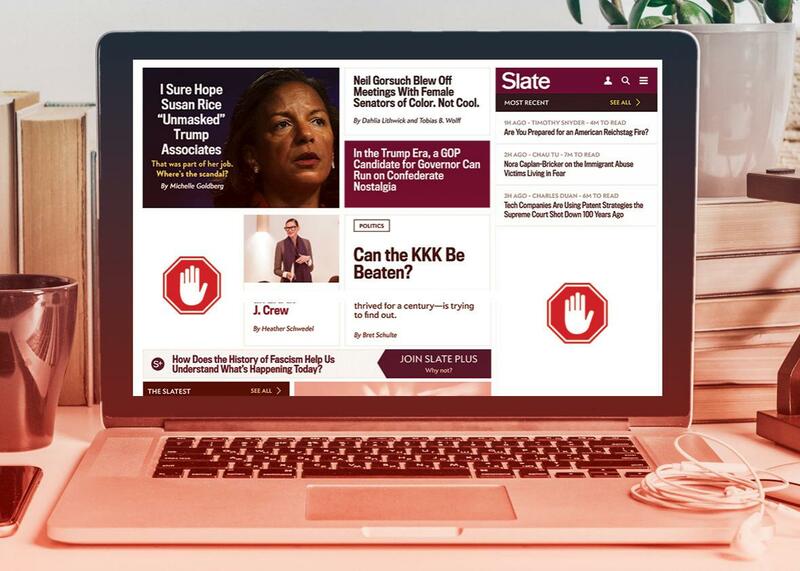 Ad blocking hurts Slate’s ability to produce the work you value. Editor-in-chief Julia Turner explained two ways you can help: Subscribing to Slate Plus or turning off your ad blocker while you’re on Slate. Here are instructions for disabling your ad blocker if you’re using one of the two most common pieces of ad-block software inside of Chrome, the most popular browser on our site (instructions should be extremely similar for other browsers). If you have AdBlockPlus installed, you’ll see a little red stop sign logo near the address bar in your browser—click that logo. If you see a green check mark and the words “Enabled on this site,” click those words. Once the check mark changes to a red X next to the words “Disabled on this site” appear, you’re done! If you have AdBlock installed, you’ll see a little red logo with a hand in it near the address bar in your browser—click that logo. A dialog box will open. If you see the words “Don’t run on pages on this domain,” click those words. A new “Don’t run AdBlock on…” dialog will display in the middle of the screen. Move the “Site” slider to the right so that it matches the screenshot. After that, click “Exclude” and you’re all set.